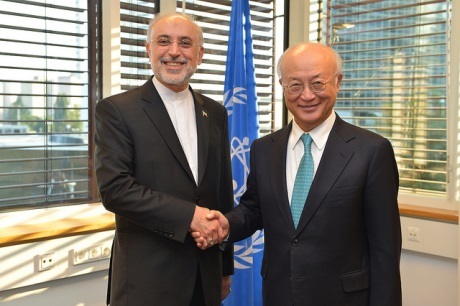 TEHRAN, Dec. 09 (MNA) – Head of Atomic Energy Organization of Iran (AEOI), Ali Akbar Salehi, said Sat. that Iranian nuclear scientists have obtained the technology for manufacturing atomic battery. Ali Akbar Salehi made the announcement in an interview on Saturday, saying the atomic battery has been manufactured by Iranian nuclear scientists and is currently undergoing the experimental stage in order to be completed. Atomic battery, also known as nuclear battery, uses energy from the decay of a radioactive isotope to generate electricity. Compared to other batteries, they are costly, but have an extremely long life and high energy density, and are mostly used as power sources for spacecraft, pacemakers, and underwater systems. Currently, only five countries including US, UK, France, Russia, and Iran have the technology to manufacture atomic battery. “We hope to be able to unveil the battery on April 9, 2018,” Salehi said. “The project is progressing well and we are hoping to see its deployment in the health sector as well as in remote places such as deserts that have no access to electricity in the near future,” he added.